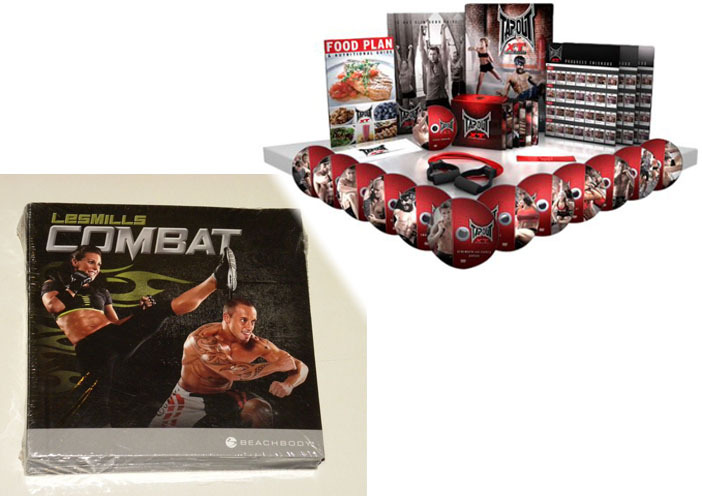 If you are bored with all the regular workout DVDs, you should take a look at Les Mills Combat and Tapout XT. These two workouts are among the best MMA workouts on the market right now. What are MMA workouts? The term “MMA” stands for “mixed martial arts”. An MMA workout incorporates the moves from one or more kinds of martial arts to train your muscles. It is a great way to get a better shape while at the same time getting to know better about the fundamentals of MMA. So, between Les Mills Combat vs Tapout XT, which one is better? Les Mills Combat is actually pretty similar to Insanity (take a look at our previous post about Insanity vs Insanity Max 30 here), except that it comes with MMA moves mixed into the exercises. It combines multiple moves from six different martial arts to create an intense cardio workout. It will train your whole body. The moves are designed to work the legs, tone the arms, strengthen the back and shoulders, and provide phenomenal core training. It claims that it is able to burn up to 740 calories per session. It makes a great way to destroy calories while developing coordination, speed, and agility. Although this workout program will release quite a lot of energy, it is suitable for beginners. It is totally non-contact, and it has no complex moves. The moves are all easy to follow. In addition, you can adjust the workout to suit your particular condition and skill. At the beginning of every session, the instructor will show the options so that you can work at your own level. There are 55-minute, 45-minute, and 30-minute workouts available, so you can adapt it into your daily schedule. Begin with just one or two classes a week; you’ll be training like a champion in no time. However, if you don’t fancy Insanity or P90X, Les Mills Combat probably will not impress you, unless you are really interested in the MMA elements. On the other hand, Tapout XT is an MMA-style home fitness program that is designed to make you lose weight, build lean muscles, and get ripped within 90 days. Sounds familiar? Well, it is indeed quite similar to the P90X workout program, except that it comes with various MMA elements. The aimed duration is similar. The Tapout XT is very cool and interesting because it features popular MMA fighters such as Chael Sonnen, Jon Bones Jones, Clay Guida, Nate Diaz, and Donald Cerrone. The pro trainer and MMA conditioning coach, Mike Karpenko, will lead you through 12 super-charged MMA-style workouts. Tapout XT is quite practical and convenient because it does not require any weight, pull-up, or gym membership. The moves are also quite easy to understand and follow. However, if compare the intensity of Les Mills Combat vs Tapout XT, the latter workout is quite more intense and heavy. So, it is more suitable for people who are already used to workouts. If you are a beginner or if you prefer a flexible workout program that you can adjust to your skill and schedule, Les Mills Combat makes a great choice. However, if you are experienced and looking for a more intense program, you can choose Tapout XT.